When, as often happened, one of the raiders lost his mount, he would proceed, running on his own feet, being careful not to set too fast a pace for the ponies. Recently I saw an old Audie Murphy movie which, even within the canon of Audie Murphy’s ouvre, was fairly non-memorable. Walk the Proud Land was an attempt on Murphy’s part to broaden his range through playing, not a gunfighter, but a man of peace. That man, a genuine historical character, was John P. Clum. The movie failed at the box office in its time, but it succeeded in piquing my interest in a man I’d wondered about before. I knew John Clum as editor of the Tombstone Epitaph, mayor of Tombstone, and a staunch friend of Wyatt Earp. I’d also read he was a devout Christian. I’d been mostly unaware of his exemplary career as an Indian agent. John P. Clum was a Dutch Reformed boy from a farm in New York state. Intending to enter the ministry, he attended Rutgers University, but had to drop out due to lack of funds. His education did earn him a job as a weather observer for the US Army Signal Corps in Santa Fe, New Mexico, however. This led, through a college connection, to his appointment as Indian Agent at the San Carlos Reservation in Arizona. Clum was 22 years old when he arrived at San Carlos, not entirely sure what he’d find. In general, he was pleasantly surprised. He found the Apaches, by and large, decent (by their lights) and hard-working people, scrupulously honest, and historically eager to be friends with Americans (it was the Mexicans they hated). 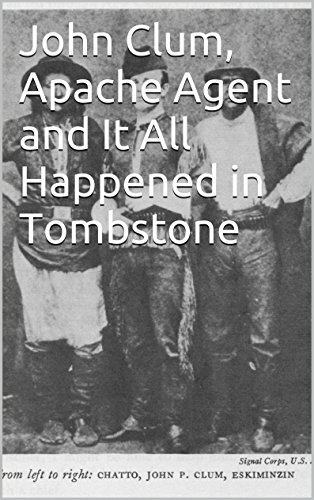 John Clum, Apache Agent, and It All Happened in Tombstone (a compilation of two books) begins with a narrative of United States relations with the Apaches, and it’s a sad and painful story. For every American willing to treat the Apaches decently, there seem to have been ten who, motivated by greed or bigotry, lied to them, cheated them, or killed them like animals. Clum set about earning the Apaches’ trust, helping the decent ones and punishing the (minority of) bad actors. In time he was able to set up a working self-government system. He was particularly proud of his efficient Apache police force, which operated with distinction and crowned its achievements with the capture of Geronimo (the only time – as Clum takes pains to point out – when he was captured without voluntarily surrendering). In time, however, bureaucratic interference and changed Indian policies left Clum with no alternative, in his own mind, to resigning his post and leaving the reservation. The later history of his Apache friends is sad to read. There is considerable pride in Clum’s account, along with great contempt for narrowminded and bigoted Americans who spoiled what might have been an exemplary peace. The only character Clum seems to hate more than these bureaucrats is the “bad Apache” Geronimo, whom he describes as a liar, a master manipulator, and a merciless killer. He is particularly offended that his friends ended up sharing Geronimo’s fate of exile and imprisonment, without the advantages that Geronimo enjoyed – celebrity status and income from souvenir sales. 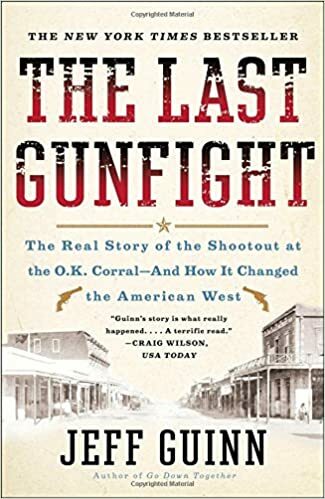 The later part of his book is Clum’s own account of his career as mayor and editor in Tombstone, during the fabled days of the Earp-Clanton feud. He is staunch in his support of Wyatt Earp (who would seem, on the face of it, an odd friend for a good Dutch Reformed boy), and (regrettably) his account varies not at all from the well-known (and much-questioned) version told by Stuart N. Lake in Wyatt Earp, Frontier Marshal. What will be fresh for most western buffs is Clum’s own account of what he believed to be an assassination attempt against himself on a stage coach run, when he ended up leaving the stage and proceeding on foot, to be less of a target. The book John Clum, Apache Agent was not written by Clum himself, but was edited by his son Woodworth Clum, from his father’s unpublished papers and reminiscences. The prose is not bad – generally avoiding the excesses of Victorian baroque. The main problem with this electronic edition is that it was obviously produced through OCR transcription, so there is the occasional misread word – as well as entire lines of text getting lost now and then. But it wasn’t enough to spoil the story as a whole. If you’re interested in the Old West, John Clum, Indian Agent, and It All Happened in Tombstone makes interesting reading. I suspect Clum left out some of the juiciest – and/or most appalling – details, so the book is suitable for most readers. None of the Earps were flawless saints, but they also were not shady characters who lucked into heroic places in Western history. What they did do, Wyatt especially, was exaggerate their accomplishments and completely ignore anything in their past that reflected badly on them. In this, they were typical of men of their time—and men today. Wyatt Earp wanted a desk job. You could argue that that simple fact is responsible for the bloodletting that occurred in an empty lot next to C.S. Fly’s photographic studio, not far from the OK Corral, on October 26, 1881 in Tombstone, Arizona. All the Earps dreamed of wealth and social respectability, but they had to settle for gambling, police work (usually as deputies), and sometimes less reputable work like pimping, until they could catch the brass ring. Which none of them did in their lifetimes. Wyatt thought he had a fair shot at being elected sheriff of the newly-created Cochise County, Arizona, on the Republican ticket. He was a deputy to his brother, Deputy US Marshal Virgil Earp, who was also Tombstone chief of police. He thought he could arrest several wanted “cowboys” (a word that meant rustlers at the time), if he made a deal with the rancher Ike Clanton to betray his cowboy friends. Unfortunately, Ike got the idea that Wyatt had been telling people about the deal, and got so mad that he spent the night of October 25 lurching from one saloon to another, bragging about everything he was going to do that two-faced Earp. This was a stupid thing to do if he wanted the deal kept secret, of course, but brains were never Ike’s strong suit. The next day Virgil deputized his brothers and Doc Holliday and led them down to the vacant lot to disarm Ike and his friends. The rest is… about 1% history and 99% myth and romance.